GLHS students were polled on what time school should start. 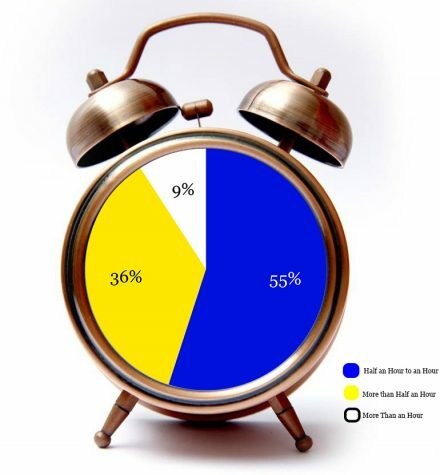 A majority of them agreed that school should start 30 minutes to an hour later. In schools everywhere, teens are finding it hard to stay awake. Tired teens are a trend all over the nation. It has been the cultural norm for so long that it is regarded as only an amusing inconvenience, something to make jokes about. However, the issue is more pressing than it appears on the surface. Grand Ledge High School, along with many other schools in the US, subscribes to a school system with an early start time, which is 7:55 a.m. This system unintentionally puts students at risk, either physically, emotionally, or academically. In the article “Your Teen Needs More Sleep” published on Sept. 21, 2017 on Psychology Today, writer Doctor Michael Breus postulates that teens are essentially “wolves,” meaning that they are most active in the afternoon and evening. This is perfectly natural, but it is also at odds with the sleep cycles of adults, who tend to be morning people. Since the school system was designed by adults, the start times reflect their tendencies of early rising. This vicious cycle affects more than just homework, however. Sleep deprivation can also lead to far more serious consequences when someone is behind the wheel. Students driving while being tired is arguably more dangerous than driving drunk. The effects themselves are similar; according to the article “Drowsy Driving vs. Drunk Driving: How Similar are They?” by the National Sleep Foundation, being awake for 24 hours and then driving is comparable to driving with a blood alcohol level of .10. A .08 blood alcohol level is considered legally drunk and both drowsy driving and drunk driving can result in heavy fines. However, since most drivers at the high school are students with at most only a few years of experience behind the wheel, the potential threat of vehicle accidents becomes even more tangible. Besides the risk of physical harm, sleep deprived teens are also at an increased risk for mental illnesses like depression and anxiety. Teens are already naturally at a time in their lives where the emotional response centers of the brain are still developing. Sleep deprivation stunts that development, which results in abnormal emotional states. Breus even states that the ability to learn and process information may be impaired by a lack of sleep. This affects learning and can lead to bad grades, which can be frustrating and discouraging to students. Some schools have proposed and implemented a later start time. Even by pushing back the time by as little as an hour, those schools reaped enormous benefits. According to another article titled “School Start Times and Sleep” by the National Sleep Foundation, these schools reported that their students had better grades, fewer absences, and less risk of drowsy driving after they introduced this new system to the school. Students cannot be expected to function efficiently when the cards are stacked against them. School districts must decide if they want school days to start early or if they want engaged, happy, and academically successful students.